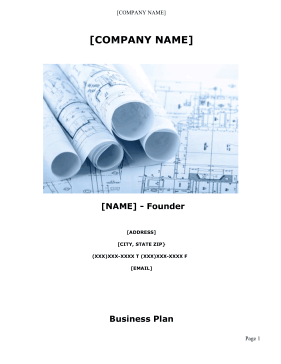 Manufacturers and those providing spiritual and mental services or products can use this free, printable business plan to organize their company and attract clients. [COMPANY NAME] is a start-up design firm in [CITY], [STATE]. In its early stages it will choose to out source its manufacturing requirements to a specialized manufacturing firm. Thus, [COMPANY NAME] will focus its start-up efforts in securing the final design patents, and marketing its [PRODUCT NAME] product line. The principal plans to utilize his expertise in the selling field and an initial investment of $5MM in capital to begin distribution. [COMPANY NAME] immediate post plan goal is to oversee its own manufacturing division in a 200,000 sq ft. facility. The proposed factory will also have the resources to develop and produce additional designs. The company's initial product offering will be the [PRODUCT NAME] solution a revolutionary idea. This product is expected to be very popular among the 14 billion dollar self-help or motivationally initiated market segment. [NAME] will use his contacts in this industry and referral networks to allow for rapid entry into this burgeoning market. In additional this one-of-a-kind product will be marketed to the religious sector, and expects to see exponential growth in sales.